Why Should You Buy From Us ? Great pieces of natural unpolished Green Aventurine straight from the Earth. Perfect size for personal use. Green Aventurine is considered by many to be an all purpose healing stone. It can assist in problems with the lungs, heart, adrenal glands, the muscular system and the urogenital system. It promotes a general overall sense of physical well being. 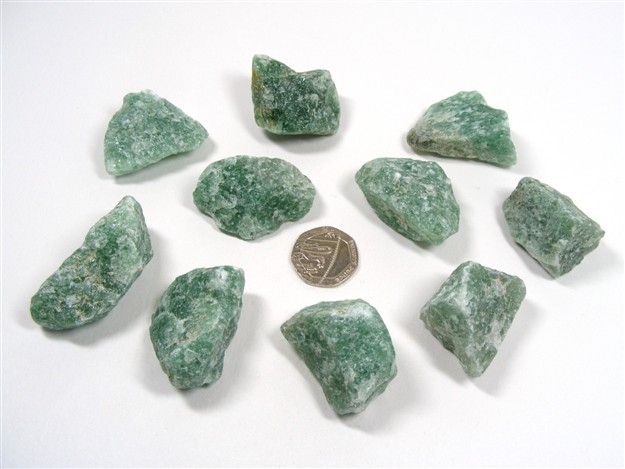 Green Aventurine is an excellent stress relieving stone, soothing our mind, and calming both anger and irritation. It promotes mental and emotional wellbeing, compassion and empathy and also enhances our creativity and originality. Green Aventurine helps us to be more decisive and to develop our leadership qualities. It wards off anxiety and fear and helps us to "look on the bright side" when faced with problems caused by lifes ups and downs. It helps us to see possibilities and alternatives. Green Aventurine has strong links to the Devic Kingdom and to Earth energies. It provides us with a very gentle grounding effect and can help in clearing geopathic stress. We offer a 100% Money Back Guarantee. If you're not entirely happy, we'll give you your money back.